There are no two ways about it, meal planning saves you money. It also saves you time and stress. If you already know what you’re going to have for dinner Tuesday night, and you’ve already purchased the right ingredients from the store, when 5 o’clock on Tuesday rolls around you’ll be ready. There is nothing worse than trying to figure out what you’re going to throw together for the family when you are tired and everyone is hungry. This is especially hard if you are trying to cook healthy meals from whole foods and not boxes. Don’t do that to yourself! That’s a sure way to end up on a first name basis with the staff at the drive through window. Take some time, sit down and plan out your meals for the week. It really shouldn’t take too long, but if you’re like me you may completely draw a blank and be unable to recall any food you have EVER eaten before in your entire life, and just sit there stumped. Every week I know that we will have some kind of soup one night, tacos on Tuesday, and homemade sourdough (my mom bakes us fresh sourdough bread and pizza dough every week. Don’t be jealous) pizza or calzones on Saturday night. It’s the same every week. I don’t even have to think about it and I just make sure I always have these ingredients on hand or automatically on the shopping list. Think of 3 (or more) meals that your family likes and that you’d want to have every week and fill those in automatically. Now you only have to come up with 3 or 4 other meals, depending on whether you plan to eat out one night or utilize one night for leftover’s/scrounging/cleaning out the fridge. Write down your meals every week in a notebook so you can easily look back and reference it for ideas. Make notes on how well the meal was liked, what you would change next time etc. This is one tip I am just now starting. As you are sitting down to make your meal plan, look back over the favorite meals. If you keep a list for a few months, you’ll have plenty of variety in your meals but you won’t have to think too hard to come up with them either. I learned this tip from The Mom Coach. Go follow her. You won’t regret it. Or go to I am That Lady and download these free meal planning worksheets. The less you have to think, the less stress you’ll have. Ask everyone what they like, what their favorite meals are and go from there. I sure hope you have more success with this than I do. The standard answers are “pasta”, “lasagna”, “mac-n-cheese”. Apparently my family likes the noodles! I really don’t even cook pasta that much. One thing that could be fun to do, and I’ve done it with my kids, is to let them look through your cook books and pick out recipes. You could also do this on Pinterest, but I find that an iffy place for little eyes- if you know what I mean. I am kind of a cook book nerd, so I have lots to choose from. If you don’t, you can always borrow some from your library for free and have a fun afternoon with the kids. Make sure you are utilizing your leftovers. I know some of you may be balking, like my husband used to. “I just don’t like leftover’s” he’d say. But over the years we have learned to be really creative with leftovers and very little goes to waste around here. Immediately after dinner, leftovers are packed up for lunches the next day. Or if it is something that can be frozen, it’s immediately put in the freezer during dinner cleanup. Think about making double, or even triple to have leftovers to USE. Please don’t make leftovers and then go buy more food! This is meal planning gold. All the greats do it. The women who have gotten wise know that a little work on the front end will save you time/energy/stress in the end. I first read this in a book years ago written by a mom of 12. I don’t know about you, but I listen to a mom who can manage 12 kids! I mean, she knows what she’s talking about! Serial cooking goes right along with leftovers, but it’s more than just leftovers. The idea is, if you are going to cook once, make it work for at least 3 meals or if you’re just starting out, at least one more meal. Take a chicken for example. A whole chicken, can provide more than just one meal. If you are so inclined, roast the chicken. Then, before you serve the whole thing at one meal, STOP! De-bone that mug, get all that delicious meat off of every little bone. Do your best to not whine like a little baby about how time-consuming or hard this is. Some women have to pluck the feathers off the bird after chopping off it’s head so… just do it. Chop, dice, slice or shred that meat and separate it to use for multiple meals. Meals like chicken fried rice, chicken tacos or taco bowls, chicken salad sandwiches, chicken soup, chicken spring rolls, chicken enchiladas… do I really need to go on? There are so many meals that you can use the meat for, I promise. Then, keep those bones and make a large stock pot of bone broth. Then do it again and again to have a weaker but still useful remouillage stock. You can use this stock for cooking rice, quinoa, or flavoring sauces or dishes. Listen, you can get creative with serial cooking. Just think, if you are going to cook once, make enough to use for one more meal in the week (2 or 3 meals if you dare). Tonight I made Bison chili and cornbread. I used 2 lbs of Bison. There are leftovers. I may make chili rice bowls, or chili and cheese tacos or burritos or something like that. The point is, I worked once and it’s going to shave off my time spent on another meal. As you are thinking about your meals for the week, think about how you can re-use what you’re already going to be cooking. Now before you throw a fit about how you can’t be so “boring” and how you need more variety or have to go with your “cravings”, take a step back and think about something. How much stress did you encounter this week around meals? What about your grocery shopping? Was it focused and easy, or did it happen on the fly? Did you hit 5 o’clock and still not have a clue what to make? Did you end up driving through somewhere because you found out there was nothing to eat in the house? Hey, I’m not judging! I have been there! Sometimes, it still happens to me. But the larger my family has gotten, the more things I have to do in a day and there is no space in the brain for “what are we going to eat tonight?”. This is one simple area of your life that you can cut out the stress. You KNOW that dinner time is coming around every single day. Put a little bit of prep in on the front end, and you’ll end the day far less tired. I promise. I realize this only covers dinners. I do plan all of the meals for the week, breakfast, lunch and dinner. I just wanted to help you get started with ONE thing. I’ll cover the other meals later and even share some of my weekly meal plans with you. 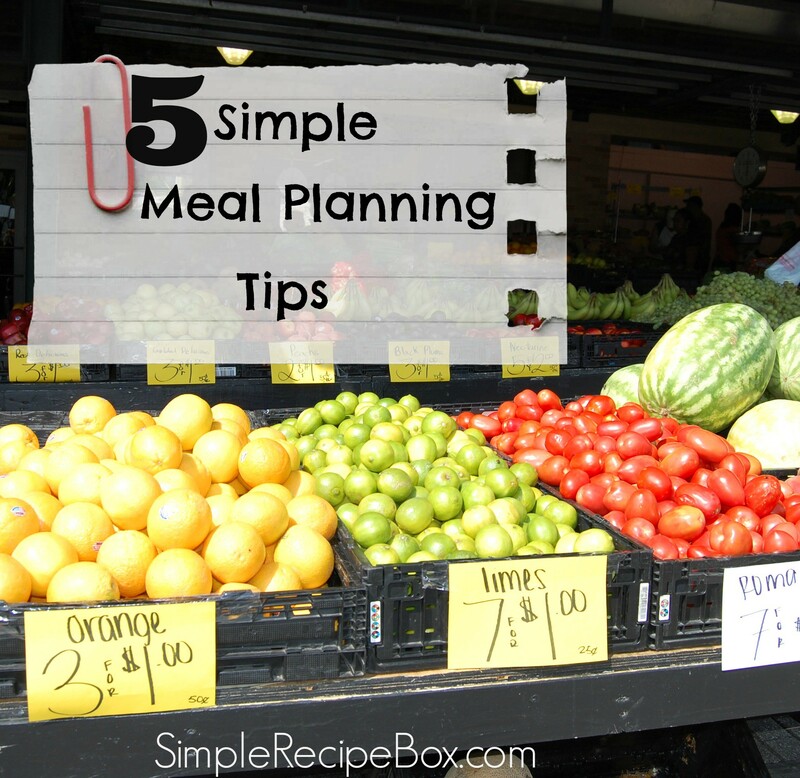 Do you have any meal planning tips you’d like to share? Leave a comment! Send YOUR favorite resources!